We usually think of a fair wind as one that will blow us into our desired port. Autumn winds do not generally meet this description in my view. A late October wind can destroy two weeks worth of glorious leaves in one night. The glory of the hills can last well into November, but only if we have no big storms. It was no breeze that blew through my hills. 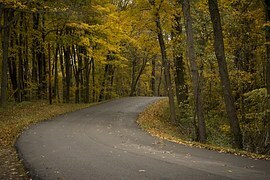 Goodly wind gusts ripped the golden glory from the hills and sent the leaves eddying like mini-cyclones on the streets. I always grieve to see the Autumn foliage go.It will not return until next year. October winds are not fair. It left me pondering, however, how we define a fair wind. I have a friend with lung disease who tells me that she doesn’t ever like the wind. She told me it feels like it is stealing her breath. I don’t mind the wind at any time but this. I have read of ships becalmed at sea in the days of sail threatening death for all aboard. Sometimes we need the wind, at other times we do not. We typically define a fair wind as one that benefits us in the near-term. Somehow all this left me pondering the Holy Spirit. The Greek word used to describe Him is the word for spirit, wind or breath. Do we define God as fair? A famous hymn describes Jesus as shining fairer than all the stars in the sky. What about the Holy Spirit? Does He blow us where we want to go? Or is it where we need to go? Do we define the way God moves through us based upon how much we want to go where He takes us? I wonder if we categorize Gods’ will as fair or foul depending upon our pleasure? My opinion of wind is purely a matter of aesthetics. I’m contemplating whether I apply my standards to God as I do to wind. Who is the master and who is the unworthy servant? Holy Spirit, blow me wherever You will. Forgive me for expecting You to fit my definitions. I recognize that You are infinite and I am not. Help me to go faithfully where you blow me and keep me always ready to call you fair. Amen.